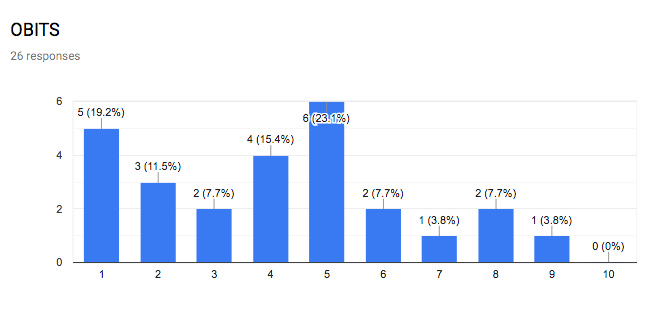 The Shining Light Crypto Survey is pleased to bring you Part 1 of the results of our community survey. 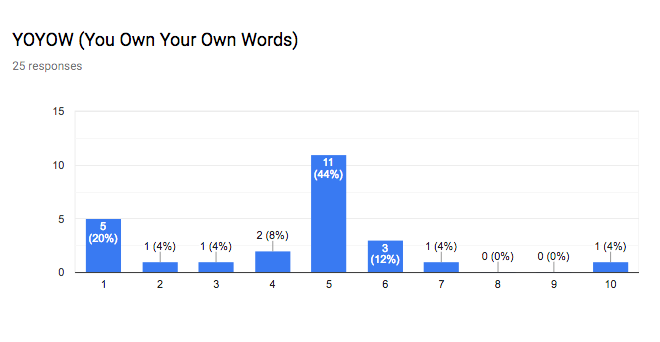 Overall, we had 32 people take the survey. This is small data set, but I believe it is big enough to get some real value. I have personally read every completed survey and all comments. Keep in mind, no one is expected to know everything. About 1/4 of the questions were skipped. This is OK, but keep it in mind as one considers the results. Most of the time this still gives us about 20 answers to have a decent small sample size. A Few warnings: All results need to be taken with a grain of salt. This is not a scientific poll. This was entirely voluntary. To some extent this is like a popularity contest. This poll is for entertainment and educational purposes only and does not represent any endorsement or recommendation to buy a coin. 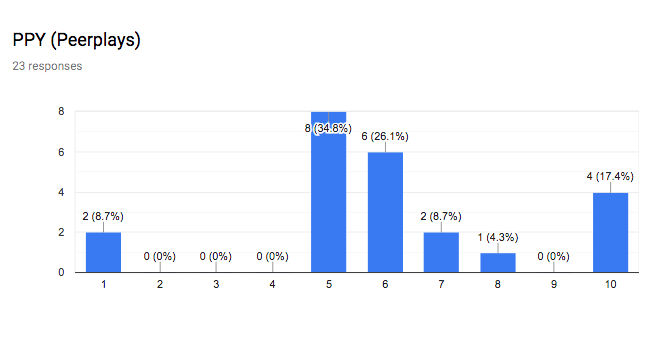 For all polls 1 in No, (Negative, Bad, Disagree) and 10 is YES (Positive, Good, Agree). A rating of 5 is considered neutral or I don’t know. 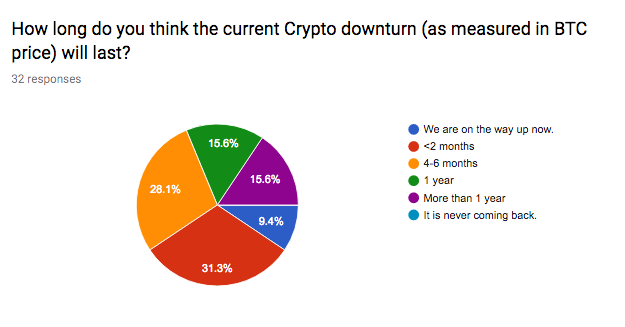 This poll was particularly targeted through telegram channels towards the BitShares (BTS) community. So generally, there is feeling Scams have hurt BTS. Not a huge amount though. 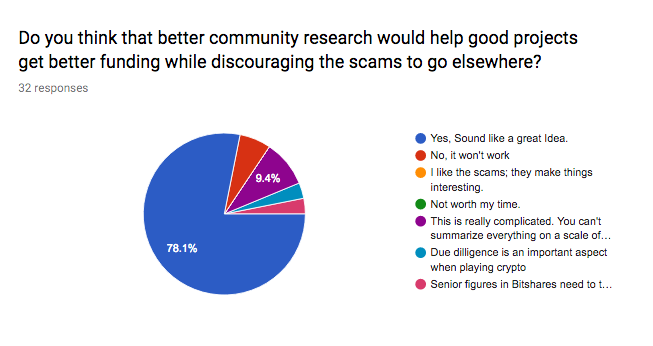 So among the survey, there was spit opinion on how effective surveys and polls can be at reducing scams. We will each be able to judge for ourselves. I remain optimistic that we will have have some good data. I understand and appreciate the opinions here. In my opinion there are a lot of aspects to any project. For example, this is not a scientific poll. In part it is a popularity content, this is not completely fair, and that could be adjusted for, but that is more complicated. It also depends on the who are are surveying. (People familiar with the coins, or people not familiar). We don't expect everyone to know everything. The good scams, have gotten a lot of followers, and public opinion was not always a good indicator of their invest-ability status. So opinions on both sides have some validity. I would also expect to get a biased group here, people that think this is pointless, are less likely to join the group or complete a survey. Where is this going? Well honestly. I don't exactly know. We will see. Overall, there is clear support people think this could help. So the two phrases that were cut off were "You can't summarize everything on a scaled of 1 to 10." and "Senior figures in BitShares need to take more care with which projects they endorse." So 9% think we are on the way up now; in 6 months 68% think we will be on the way up. What Crypto Project Currently Excites you the most? 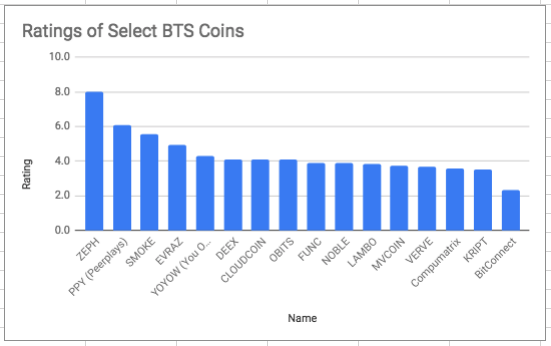 As a BitShares survey it is not surprising that the coin ranked in well. I have to say I had a little fun throwing this one in there. BitConnect was a huge Ponzi Scheme that failed in January of this year. I have to say I wonder about people that rate this a 10. (While it could be sarcasm, that really isn't going to come through.) That said, those who rated it a 5 -may not understandably know anything about it. 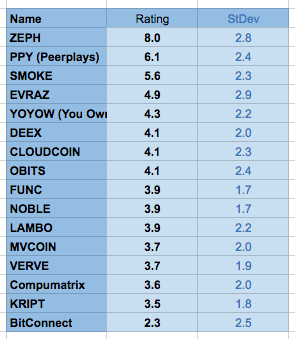 Several of the coins were put in as a measure to attempt to see how good the community was at rating coins. In that way, 6 of 23 people may not have passed the test. This is why we need to take all the results with some salt. Clearly, though 17 people knew what the deal was! It is this knowledge of the community we are attempting to harness. This summary table also shows the standard deviation of the results (if you don't know what that means -don't worry about it). 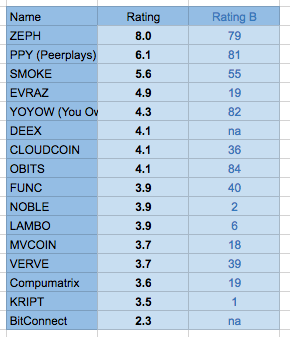 I also have another rating system I am playing with... "Rating B" runs from 1 to 100 and this is based against 100 other coins on BitShares. It is a percentile system so 50 means better than 50% of the other surveyed coins. Many of these coins were not well known. More than 1/3 were absolute junk. 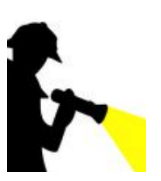 The whole point was to survey the lessor known coins and reveal insight. 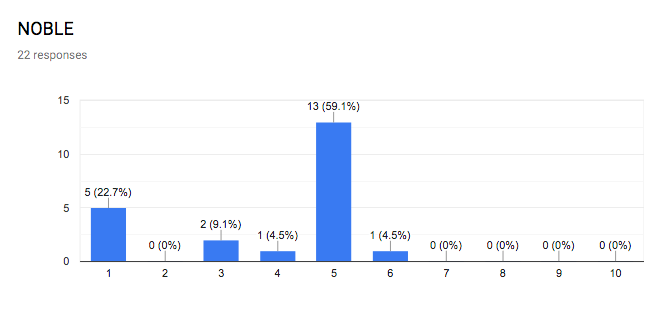 That said, I would say I think the community was generally able to determine which were which. I came into the survey with limited expectations. I have hopes, but also realize good data analysis takes time. 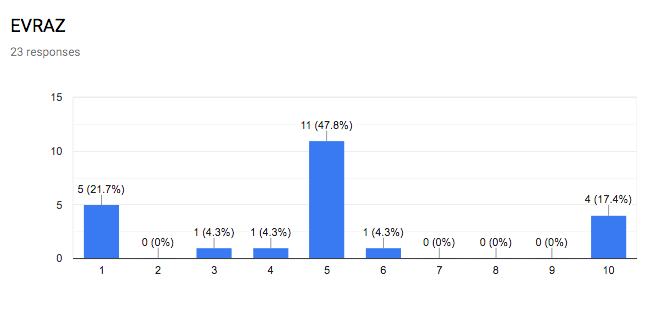 If everything were as simple as a survey, it would be done already. 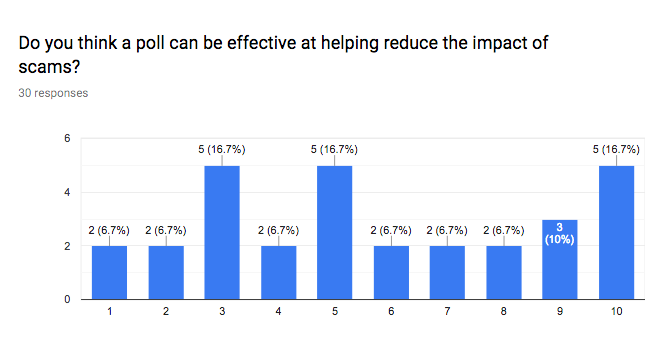 One can have a legitimate project -such as an Android app in a another language- and without a marketing team or people in other languages using your product not score well on a survey. I do think there are some real insights here. And I do think it is worth exploring this survey method with a few more surveys. 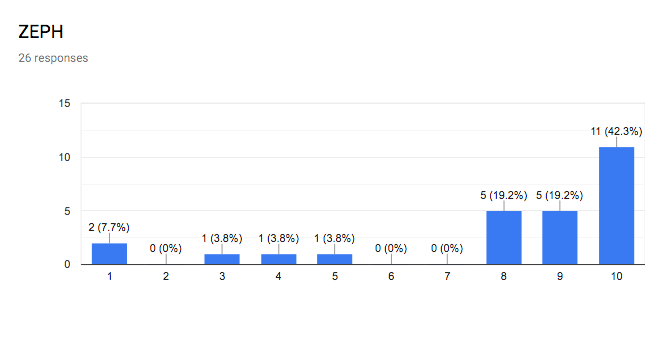 Overall, people took the survey seriously, I did not feel as though there were major attempts to bias the results. I have not had to delete responses. There are lots more questions that can be asked. Please join me... I have posted the link for the next survey below. Lets Keep the Momentum Going. 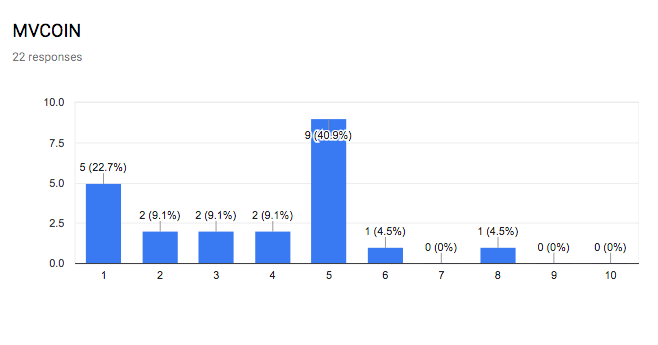 Here is Survey #2.